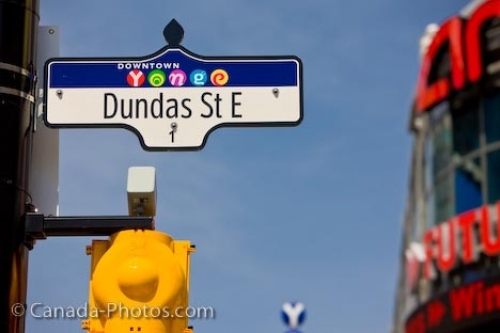 A blue and white street sign for Dundas St E is attached to a large pole over a yellow stop light. The street sign is at the corner of Yonge and Dundas Streets in downtown Toronto. In colorful letters, Downtown Yonge is also written on the sign above Dundas St E. Sitting in the background is a large building with large red letters. Street sign on the corner of Yonge and Dundas Streets (Yonge Dundas Square) in downtown Toronto, Ontario, Canada. Street sign for Dundas St E in downtown Toronto, Ontario.